So Hershel Patel came in place of Khaleel. 296 / 8 in 50 overs but other day India B hits 175 in only 25 or so overs vs India A. If you have player like Iyer+Vihari 297 not difficult here. Apni biwi ki Khubsurti se'' jane Jana'' pasand kerte hai. Is today's game going to be telecast? I heard HOTSTAR available in USA now but I doubt they showing deodhar there. Prasidh strikes early.. lets see how Vihari does against Kar bowlers. Prasidh is not achieving his full potential in pace due to lack of hang time. He has bowling action quite similar to Cummins but Cummins has a hang time. one more for Kar... Vihari gets bowled. amazing stuff by Prasidh. He has outbowled all the fast bowlers who bowled in these two games. Prasidh getting steep bounce, has good seam position, getting some balls to skid too, moving the ball both ways, bowling in good areas. If only he can bowl a bit quicker ! he is quick enough and and will get quicker, bowls up to 140. Good observation, so when ur right arm starts late into the action it will make up with swifter ritation to get insyc with rest if the body, A bit simikar to Flintoff as well? Lullu cricket. Ball was so wide. Manoj Tiwary slashes at it. 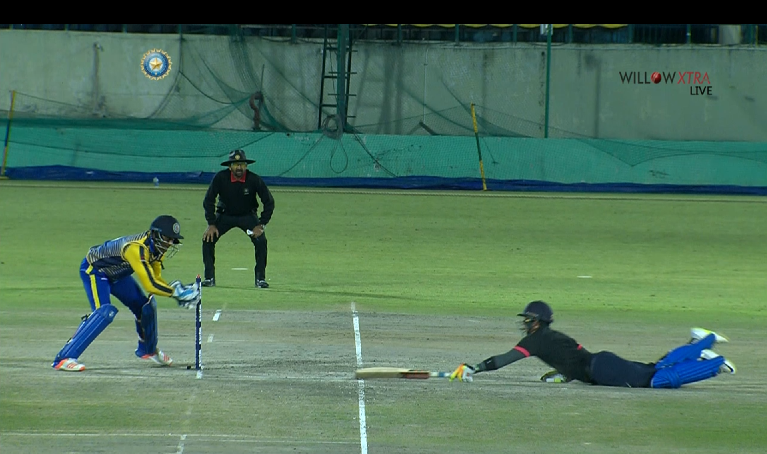 Regulation catch dropped by Karnataka keeper. This Pradeep has mediocre pace. But he is bowling outswingers. I would say poor man's Balaji ? The drop. I would say it is easy. But commies say he is usually good. This Mithun is such a generic trundler you really expect him to be whacked around every time he bowls. Somehow these guys are not punishing him enough. WHat a horrible pitch. Ball often times doesn't rise above the knees. Who's been the quickest till now. 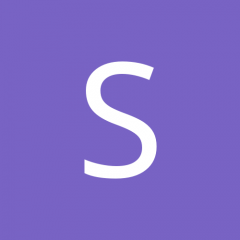 P.S I'm new to this so anyone can give me some pointers to using this site. None. But Pradeep has something they can work with. He pitches just short of a length or good length and get the ball deck away. But long long way to go. He looks like he just got from the bed after hang over or a long night with Mrs.Binny? Either way he is a lucky guy who just picked up the wicket of Iyer with an half volley. That ball should have been pummelled straight over his head. Not seen this siddhes Lad much. Looks like he has great season so far with 3 centuries an average of 62. Iyer looks oike a version 2.0 of Jumping fidgety jack Kartik, n Tiwary is a phattu as soon as he sees someone bowling over 135 he pisses in his pants. Headless Lad was running like a mad man hitting straight to fielder. Luckily he survived. This pitch has hardly any bounce. Doesn't get above the knees. Once if it does he will be found out. Rela mediocre cricket so far. Wish they had come up with a better India A/India B team. Look at Siddesh Lad's reaction to a bouncer.Let that sink in that bowler is Stuart binny bowling on a docile surface with no bounce lol . He is averaging 62 this season. This is almost the best. This track does behave unfairly n did so before in a international game with one side getting excellent batting conditionsf n second side batting gets thrown uder the bus. Tiwary can be at times a loose stroke player. But he scores all around the wicket. 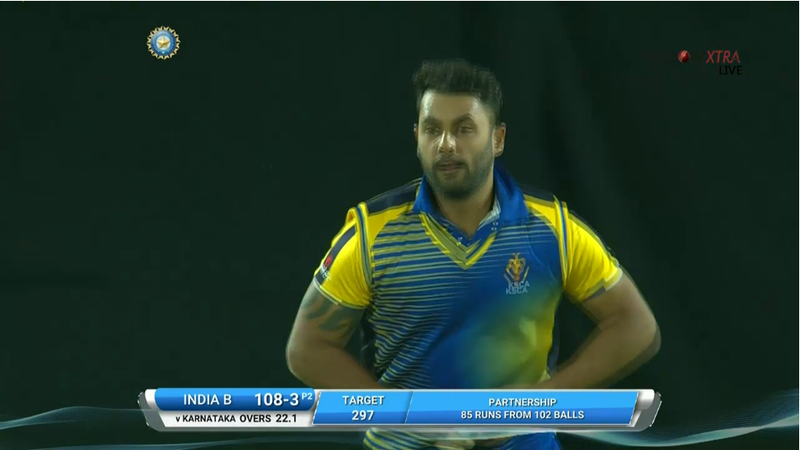 If Tiwary and lad can stitch a good partnership together then it shouldn't be much for India B. Next is Jayant Yadav. Then the tail. SO it is hard. Harshal Patel is an all rounder too . So he can be quite handy too. Pradeep is the only guy who has something in him they can work with. 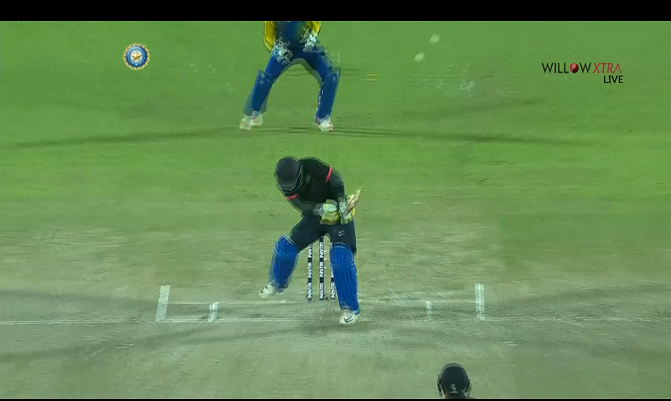 Tiwary is getting away with some loose shots. T Pradeep. Didn't watch the first part. Karnataka bowler. But a long long way to go. What a six by Tiwary. Wow. That is a pretty big six.